In the mid 1970's a special variety of Jfet invented in Japan called a Static Induction Transistor (SIT) found its way into the “Vfet” power amplifiers produced by Yamaha and Sony. These amplifiers were produced for several years and then discontinued, but are still highly regarded in the high end audio community. SIT devices have a unique characteristic which is of particular value for audio amplifiers. 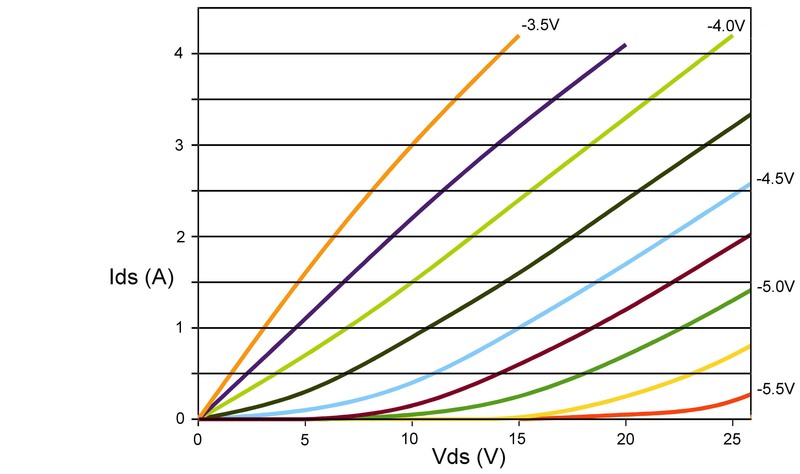 Quoting inventor Nishizawa's patent abstract, “(The) drain-current to drain-voltage characteristic simulates the anode-current to anode-voltage characteristic of the triode vacuum tube very closely.” They have found use in radar and other exotic applications, but after Sony and Yamaha ceased production, versions suitable for audio power amplification have been highly prized and difficult to obtain. Recently there has been renewed interest in SITs, partly because two audio companies have stepped up to the plate and spent the money required to fabricate new devices suitable for audio power amplifiers. The first of these is Digital Do Main in Japan, which has produced two audio amplifiers based on newer versions of original Yamaha Silicon parts. The other is First Watt, which arranged for a production run of a new SIT device using a newer Silicon Carbide process by SemiSouth. Audiophiles often go to great expense to achieve as little as 5 watts of power using Triodes because of their specific sonic character. Unfortunately triode performance is limited partly by the need to transform the high voltage / low current operation of the triode down to the low voltage / high current domain of loudspeakers. This means a transformer and all the distortion comes with it. Of course it would be nice if Triodes drove speakers without transformers. It has been a goal of some designers to get transistors to sound like Triodes, with very limited success. Fets can sound like Pentodes, but it takes a particular set of gyrations to make a Fet do the “Triode trick”. Then there are those who think nothing less than a glowing bottle will satisfy tube aficionados. Perhaps that is true, but it isn't going to keep me from trying. There are two things we want out of a solid state device for this purpose. First, we want a “square law” input characteristic like that of tubes. 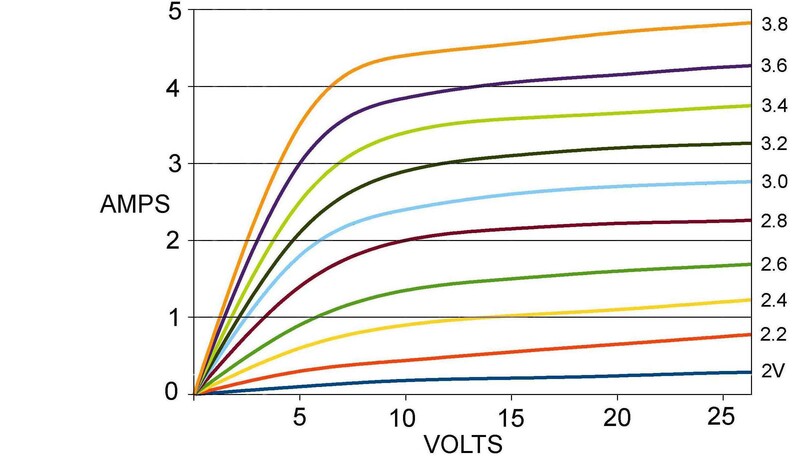 Fortunately, Fets do that already – the current through the Fet is a good square law function of the Gate to Source voltage. Second, we want a low Drain resistance, equivalent to the Plate impedance of the Triode. This is where gain device can be regarded as a variable resistor instead of a variable current source. First, it allows a single gain stage with both voltage and current gain, and having a high input impedance and low output impedance without a feedback loop or degeneration. Second, this character allows “working the load-line”, the particular description of the path of the gain device through the voltage/current region in the course of amplifying into the loudspeaker. By choosing this line wisely, you can achieve intrinsically lower distortion. Pentodes and Mosfets aren't very good at this. Third - like Triodes, SITs have a soft overload characteristic. When over-driven on peaks they present compressed, rounded waveforms instead of sharp clipping, the result being that they are more graceful under pressure. 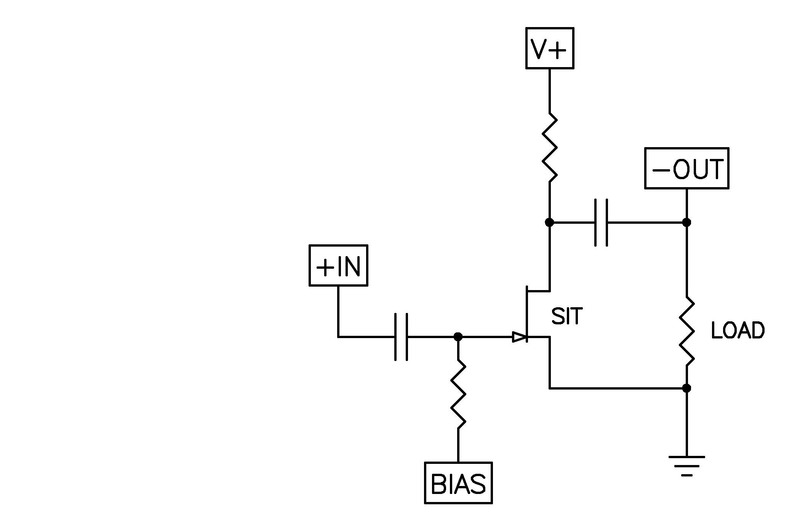 The entire effort revolves around simplicity and minimalism in circuit design. Certainly you can get good objective performance with multi-stage circuits and negative feedback. What we want is the sound that can be had from a single gain stage giving both voltage and current gain operated single-ended Class A without feedback or degeneration, and we want it with a high input impedance and a low output impedance. And we want it with reasonably low distortion with a simple low order character. We can try this with Pentodes or Mosfets, but the results don't measure well, and they don't sound as good. This is a clear-cut case where measurements and subjective performance agree. It is worth noting that the original efforts by Sony and Yamaha were not minimalist – they contained many parts in multiple gain stages and used a generous amount of feedback. There are several reasons for the push toward minimalism. The first is simply aesthetic – there is much to admire about an amplifier which performs well with only one transistor. And of course there is an attractive challenge, which is “How good can you make such an amplifier?”. There is another, more practical reason to explore simple circuits. It is generally agreed that if you are going to have distortion, you will want it in a low order harmonic form, kept to only second and third harmonic if possible. A single-ended Class A device is going to generally give you the simplest version of this. Lots of audiophiles dislike the sound of negative feedback, or at least think they do. It is true that while negative feedback reduces the amount of distortion, it does tend to re-arrange it so that the character is more complex. The bandwidth extends to about -3DB at 200 kHz with a 600 ohm source impedance, and with a 50 ohm source, it makes a decent little AM transmitter. Of course the audience for such an amplifier will only want to know about the sound. How does it compare with SETs from a subjective point of view? Having made a variety of these amplifiers at this point I can say that first off, they can be made to sound exquisitely in many of the systems that would enjoy the performance of a SET amplifier. These would be your high sensitivity loudspeakers featuring compression drivers or “wide band” drivers with big magnets and light paper cones. The amp sounds "big". There is a large, open sound stage that fills the room, that is the first thing that you notice when the amp is plugged in. The effect is a little intoxicating. ...the SIT seems to bring a lot more control & detail to the speaker. The tube sweetness is present, yet the presentation is very clean. This is like a very nice low distortion SET. The SIT presents details, but with proper dynamic contrast. Details do not poke you in the eye, they just naturally unfold as part of the music. Do simple SIT amplifiers sound the same as single-ended Triodes (SETs)? That would be a matter of opinion. 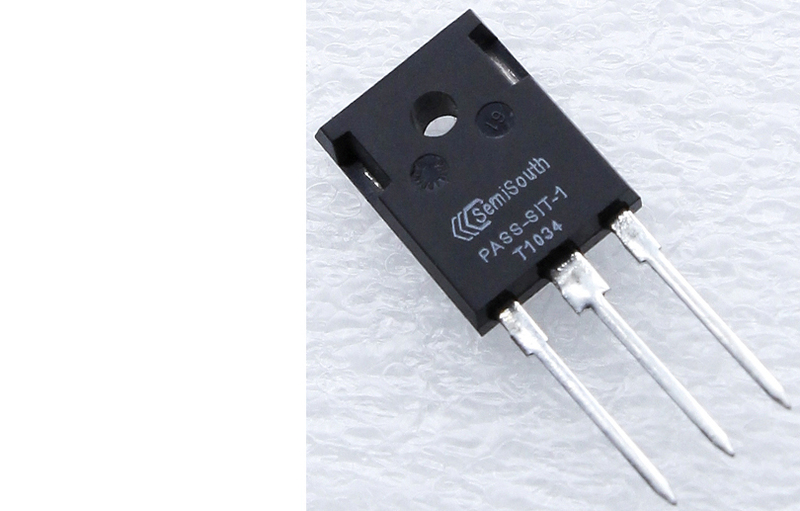 Without an output transformer with its significant limitations, the SIT has a bandwidth and distortion edge. On the other hand, some people like the sound of their transformers. Me, I like to listen to the sound of different amplifiers. I don't see a practical point in actually duplicating a SET amplifier. The SIT gives me an opportunity to listen to the best that a single gain device can do. Surrounded only by a few well-chosen passive parts, this transistor speaks with a single voice. It doesn't sound quite like anything else.